Get ready for Thalaiva's next project. In case the spectacle that was 2.0 was not enough to keep you entertained for the rest of the year, here is a treat for you. Rajinikanth's next finally has a title - Darbar. It was previously being called Thalaivar 167 before being given a title. The movie is being directed by AR Murugadoss, the man behind Ghajini. Darbar looks every bit of interesting from the first look that was launched today by Lyca Productions, the same production house thank bankrolled 2.0. The poster was launched on the Twitter handle and it's quite a piece of art. We get many hints about the story of the film from the poster itself. Avengers EndGame Director Joe Russo Reveals How Rajinikanth's Enthiran Almost Inspired The Climax of Age of Ultron. Darbar goes on floors after the launch of the poster. 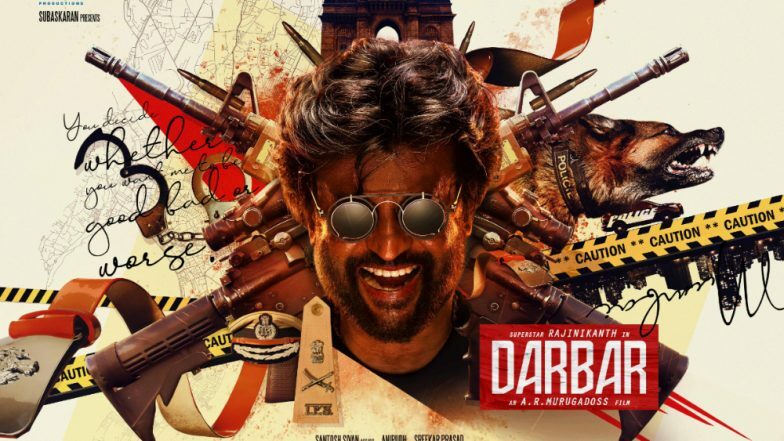 The first very obvious hint we get from the poster of Darbar is that Rajinikanth will be playing the role of a cop in the film. We can see a police uniform on the poster. Some reports also suggest that the actor will be seen playing a double role in the film. Another major hint is that the movie will be set in Mumbai, as you can see Gateway of India, the popular monument in the city, in the background of the poster. There were many rumours that Nayanthara was not a part of this project anymore. But all rumours to rest for once and for all, the makers mentioned Nayanthara while revealing the poster. She has worked with Rajinikanth in movies like Chandramukhi, Kuselan and Sivaji. Earlier, some pictures from the photoshoot of the poster of Darbar had leaked online. The makers had to ask the fans to not reshare the leaked pictures and request them to wait for the official revelations. Well, the wait was worth it.